Our family loves Sandra Boynton books & music! Making her books interactive increases the interest of our tiny grand-toddlers & my daughter’s speech therapy patients. Very engaging. Downloaded bundle, but no sound, waste of money, there is no support. Don’t buy. Downloaded Hippo book and it worked great. Not sure the problem but there does not appear to be a fix so if you buy it you are stuck. I downloaded the app and there is no sound at all. I am super bummed as I think my son would like this. I downloaded the bundle of 5 books and will be asking Apple for my money back as this app does not live up to what was advertised. DO NOT BUY THIS. The audio worked when I first purchased the bundle.However, shortly after a few reads, the audio quit working on all but one book. If someone knows how to fix this, please make a note. Tried to re-install. Still no sound a year later. I just downloaded the bundle and only one title plays sounds when I select that it be read versus me reading myself. 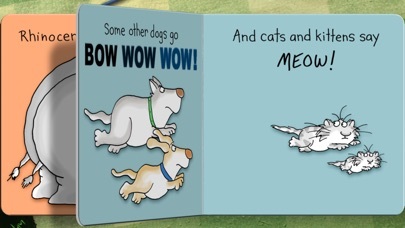 Bummed because these are our favorite books for both my boys through the years and the interactive features are great. I didn’t see anywhere for troubleshooting. Looks cute but no sound. Unbelievable that reviews from a tear ago say same thing and hasn’t been fixed. Soft mute must be turned off for the sound to work on my phone which means putting my phone off vibrate. This makes no sense for such an app and this is for the developpers to fix. Hence the bad rating. Appart from that, my son really loves the book and loves this app. It's a really great and fun app for kids. No sound that users reported is due to “soft mute” in the devices. Google it or if in iPad, open a control tray from top right corner and tap a “bell button” to unmute. App's low reviews are because of the sound lost due to device settings, which is a shame! It’s a wonderful fun app to play with. We have several Sandra Boyton’s book that my 3-year-old daughter loves, so I downloaded all 4 book for the plane. It’s so much fun, the books came alive. Sound does not work, what a rip off. My 2 year old granddaughter LOVES this book. Such fun and she loves that she can "work" the book herself. My 14 month old loves this app...very impressed! I am very frustrated and disappointed in this application. It is defective and has no sound track. I have tried various ways to try to find the volume, but it is not working. I warn you not to waste your money. Hopefully someone will read this and reimburse what I paid for it. This is a huge problem when purchasing applications, that there is no recourse for returning something that is unacceptable. It is also disappointing that there is only one book for the cost. A huge rip off. What a rip-off! For 4 bucks this app is little more than a talking book. I have gotten much better apps for free. Don't purchase this. A five star interface and format to go along with a five star book. I love this app, but it needs to be updated - please! Love Boynton books, but no sound in app not cool. Love Boynton books, but no sound in app. Not cool. 100% satisfied. Great app! Very fun and interactive. We love these books. We read one or two or three every night before bed. These are the greatest books ever. 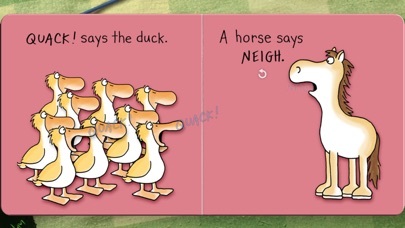 We love Sandra Boynton. 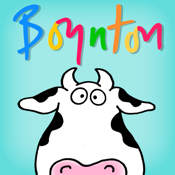 I love Boynton's books and the apps are great as well. They follow right along with the stories with her illustrations, but add just the right amount of interactiveness for the iPad. Only 3 stars because the app is very weak. Only a narrator and some animated animals. It's just as good to buy the book or the app but not really both. Love the book and love the app. The only problem is the sound does not work sometimes in some of these book apps for these series. It does not matter if I use the app on my iPad, iPhone 5c or old iPhone 4, that I use for the grandkids. However, if I attach a set of earplugs to the device(s) the sound will play for the book app. Not sure why this is the case. 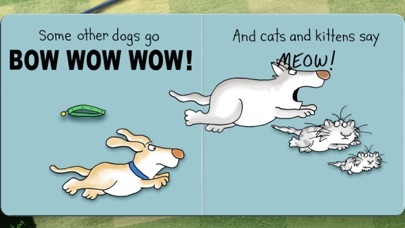 I love all the Sandra Boynton books! I read them to my children every night and they love playing with all the pages. My son and I love these books. The apps really make them come alive. Fun animations and sounds. My 2-yr old son has about 40 ipad things to choose from and has loved these Boynton apps every day for the past year (already!?!). He loves moo-bah the best with barnyard dance a close 2nd. He has the hard books and could care less about the narration - he just loves the fantastic interaction - perhaps the best you will find in early kids books! (Who knows... Maybe someday he will realize the story is being read to him and it may be like getting the book all over again!). I just found the one with the chicken and the colored clothes today and didn't even flinch at the cost. Absolutely worth it from 18mos to 3 years or more. Way too short for the price. I wish I had listened to the other review. This is about 5 pages and 1-2 minutes, should not cost more than .99. The app is supposed to read the book aloud and interest the children when they click on the animals and they make noises; without sound, it's useless. I wish I'd believed the other reviewers on this one before I bought it. Awesome! 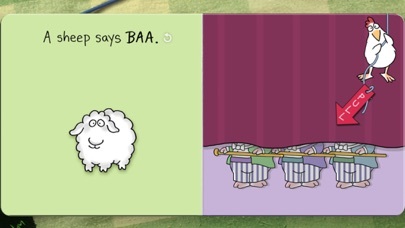 I had planned to buy these books and noticed this app recommended by a speech- language pathologist. I am also an SLP and have been building my literacy library for early childhood kiddos. I love the interactive characters, having the choice for The book to be narrated. I am excited to use it in therapy! Super! This app won't play any sound. Total waste of money. 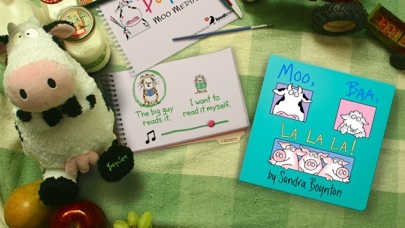 My 2 year old grandson couldn't sit still long enough to "read" a book until I discovered Sandra Boynton's Moo Baa app! I can't wait to surprise him with the remaining books tomorrow! The quality of the animation and noises is wonderful! Well worth buying! Waste of money... The kids looked at it once and that was it. I will be removing it from my phone, waste of space. We all love this app, child and adults alike. It is interactive, fun and a bit goofy, just perfect! My 2 year old loves this app. The interactive component is what keeps his interest. This should be fixed or taken off the market. I cannot get sound to come on. I bought this book to try because it is our daughter's favorite, and now I would like the other Boynton books. Is there a way to complete the collection at a price the way you can in iTunes like complete my album? A little disappointed. My son is more excited with the animation of my voice when I read the book, than the animations and sounds from this app. Not worth the $ paid. No sound on iOS 9.1. Figured out the sound issue! I took my phone off of the manual vibrate/mute and presto! Great book! The kids love it! We have both the book and the app of several of Sandra's books. The added interactive features give just the right amount of toddler fun. Yes a bit expensive, but overall, worth more than having the baby sit and learn how to play angry birds. Love the book, love the app! This app is so much fun for kids and the adults who read the book with them! We have the board book version as well, and every time we read that one my son asks why the pictures don't move or make the sounds. So fun! Definitely a great purchase. No sound problem was fixed when Inreset and had checked the screen lock toggle and mute button. Graphics good. I read the board books to my older girls when they were little, and these digital versions have keep the quality while adding some fun that stays true to the feel of the books. Only 1 out of the 4 books has sound. My 18 month old loves books. This is perfect to keep her quietly entertained and allow her some reading time.